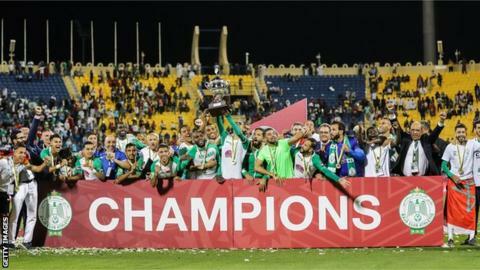 Raja Casablanca of Morocco deservedly won the African Super Cup on Friday, narrowly beating Tunisia's Esperance 2-1 to lift the trophy for the second time. Goals from Abdelilah Hafidi, a superb first half strike from 20 yards, and a neat close-range finish from captain Badr Benoun in the 65th minute sealed the win for Confederation Cup winners Raja. The goals came either side of a superb goal from Youcef Belaili, who smashed home an equaliser in the 57th minute, for the African Champions League holders. The Super Cup is an annual one-off match pitting the winner of the Champions League and second-tier Confederation Cup against each other. Friday's match was played in the 2022 World Cup host nation, Qatar, the first time it has been played outside Africa. The Qataris used the match to help train its staff and test its facilities ahead of 2022. Esperance now stay in Doha and will face CA Bizertin in the Tunisian Super Cup on 1 April at the Al Duhail stadium. Phuti Lekoloane is trying to break stereotypes and pave the way for other gay footballers in South Africa. The late Zaire international Pierre Ndaye Mulamba lived a life of two halves that went from fame and praise to anonymity and poverty. Riding BMX bikes keeps young kids from the ghetto out of trouble, says Nigerian rider Starboy. Time for a unified African transfer window? Of the 52 African countries whose transfer windows are listed with Fifa, no two use the same date - causing problems for many clubs. Is it time to change the system? Who is Callum Hudson-Odoi & how good can he be? Why do Bayern Munich want to make Callum Hudson-Odoi, son of a Ghanaian footballer, the costliest English teenager ever? South African Cindi Gold says she is carving a path for other black women to join Africa's pro-wrestling scene. Liverpool forward Mohamed Salah is the 2018 Confederation of African Football Player of the Year for the second consecutive year. Napoli supporters hold aloft posters and banners in support of defender Kalidou Koulibaly before their Serie A match against Bologna. Hardlife Zvirekwi's arm was amputated but he is now back in the Zimbabwean Premier Soccer League. Somaliland is not a UN-recognised nation but four men are trying to set up a national football team nonetheless. South Africa's Laura Wolvaardt has a choice - follow a path in international cricket, become a doctor or pursue a music career? How did Man City v Spurs' incredible finish make you feel about VAR?